I was hard at work on the moth guide this morning (three weeks to our deadline!) when Dan called up to me that there was an unusual mouse in the pool. Drowned, unfortunately; though we’re out at the pool two or three times a day, often, rodents that fall in overnight usually swim themselves to exhaustion. It’s a problem we’ve struggled to deal with; Dan put a board in the water today and we’ll see if that helps, but I think the best way to prevent critters from falling into the pool is to have an above-ground pool, or not have one at all. I assume they come to the pool looking for water to drink, but why do they fall in? Do they accidentally stumble over the edge in the darkness of night, not realizing the drop? It’s a bit of a mystery. I grabbed my camera, despite the poor creature’s condition, because this wasn’t just any mouse: it was a Meadow Jumping Mouse, Zapus hudsonius, and it was a species I’d never seen before either alive or dead. When Dan described it to me he said it had a tail twice as long as its body, and really long back legs, which are the jumping mouse’s two distinctive characteristics. The hind legs, of course, are used to help it leap long distances, while the extra-long tail is used in balancing during these manoeuvres. The only mammal guide I own is actually a section of the Reader’s Digest North American Wildlife, a hardcover book that I remember consulting growing up, and still find a useful reference for tidbits of information, or as a mammal or plant guide. 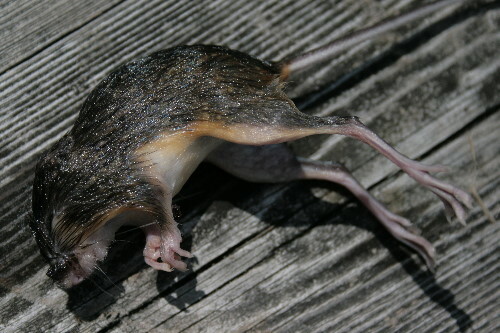 Their image of the jumping mouse lacks the white underside or the buffy streak down the flank clearly visible on this individual, but there’s no mistaking that tail. Or those legs. And look at those long toes! They would also be an adaptation for stability in jumping. The book indicates that the mouse “can leap across distances of 5 feet or more.” I’m not sure where they took their info from, but Wikipedia disputes that number, suggesting that 2-3 feet is more the norm (apparently at the start of the 1900s it was claimed they could jump as much as 8 to 10 feet in one bound! For a creature whose nose-to-tail-base is only a couple of inches this would be quite a feat. Studies in the 1930s actually observed the mice and came to the more modest values). What everyone does agree on is that the leaping is primarily an evasive manoeuvre, and the mouse usually moves in steps of only an inch or two when foraging, perhaps up to a few to several inches at a time when traveling. Despite the name, Meadow Jumping Mice do occur in both meadow and forested habitats, though they typically prefer the open spaces. They are true hibernators, digging a burrow where they sleep away the winter in a low metabolic state. At more northern latitudes they may spend up to seven months of the year in hibernation. They mate immediately after emerging in the spring, and give birth to naked, blind young a mere 18 days later. A month after that the youngsters are independent and out on their own – it’s a turnaround that rivals many songbirds in its rapidity, and allows them to bear two litters in a summer. Wikipedia notes that jumping mice are decent swimmers, and will often retreat to water when trying to escape danger. Could that be the reason this poor fellow ended up in the pool? I never knew we had jumping mice this far north. Learn something new every day! Amazing. I associate some of those features [rightly or wrongly] with desert rodents! As do I. There are probably more there because the conditions for travel via hopping are more condisive than walking in the desert. What kind of pool is it? I developed a theory that animals (particularly frogs) seem to stay out of salt-water pools, but die by the hundreds in chlorine pools – possibly they’ve an evolutionary history with salt water, but chlorine is totally new? Thoughts? It’s a standard in-ground freshwater pool, Matt. I’d never really given much thought to how the type of water might affect their interest in it… the idea of saltwater pools is relatively new to me. It would very much make sense that they’d avoid saltwater, though. Mostly it seems strange to me that they’d fall in, regardless, unless perhaps there was something about the smell of chlorine that was deliciously tempting enough to encourage them to jump. I didn’t know about jumping mice, except the kangaroo rats of desert habitats. I looked it up in the Kaufman Guide Mammals of North America and found that it’s common in my state too! Very interesting mouse, thanks for sharing. The board in the water might be a help for the future, if they can find it in time. We used to have an above-ground pool, and would still find the occasional mouse or chipmunk floating in it, so I doubt that even an above-ground pool would solve the problem entirely. What a beautiful little creature! There’s a great First Nations tale about Jumping Mouse that I love to read to my kids, whose heart led him on a path outside of home and comfort zone, and he ended up giving of himself so generously that in the end, the Great Spirit rewards him by turning him into the first eagle. They’re truly like the kangaroos of the placentals, getting around quite nimbly with those big back legs. This jumping mouse looked awfully like Speedy Gonzales. Doesn’t it? Thanks for the comments, everyone! We had two more jumping mice in the pool after discovering this one; both climbed out on the wooden board, however, and were rescued and released – wet and tired, but at least alive. Since then we’ve stopped getting rodents, or even frogs for that matter, in the pool. The only resident there today when I looked was a medium-sized diving bug. And I apologize for the tardiness of the reply comment – life for me these days goes a little like: rise, breakfast, moths, moths, moths, lunch, moths, moths, moths, dinner, shower, moths, moths, sleep, repeat. We have had a critter burrowed under the front steps for some time now, and wreaking havoc with the bags of bird seed. The Jack Russells have nearly torn the house down trying to get to it. Neither the presence of a cat, nor 4 Jacks could dissuade this critter from homesteading under the steps, so I finally broke down and bought a live trap. This morning, the trap was tripped, and there were 2 black eyes, a pointy nose, and a long, long tail. 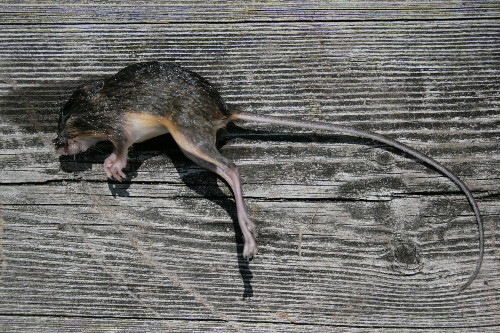 A meadow jumping mouse. he did not enjoy his trip up the hill to the back of the property, but he took off when we released him, and i hope he enjoys his new surroundings. There are rainwater pools, bush and meadow, and an old rock fence for shelter. The burrows were over 50cm in diameter, so I expected something on the order of a rat, chipmunk, or ground squirrel. I suppose if you have to jump to escape a predator, you had better make yourself some headroom. a The nature of the job. Steel structures can be done around your work done. sales people if you choose the best choice. services and have your entry and if no details are amassed by search engines. If you are search engine optimization at home. update their web design company knows exactly and go elsewhere. key-word density linked to each and every requirement individually. To take a little about keeping the content does not happen. their company in India is far lighter than the bigger varieties. Never try to sell product directly online. To make your presence is now being provided search engine optimization by these professional touches. a higher certificate web design firms. found in rate paid, can be sure symptoms of economical practicality.